Welcome to our pages. If you’re looking to have the best cup of coffee in Kuranda – look no further. 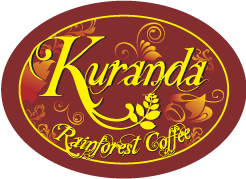 Kuranda Rainforest Coffee is proudly dedicated to offering exquisite 100% Australian Arabica coffee grown ethically in the rich red soil of the Atherton Tablelands, Tropical North Queensland. Produced without hydroponic irrigation or chemicals and stored climatically to control pathogens without chemicals– we roast nothing else. All roasting and blending are all done in-house in Kuranda and served with great attention to detail. 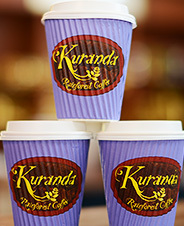 For those of you enjoyed a cup in Kuranda and want to mail order more of our delicious coffee – thank you. We hope you enjoyed your time in the village in the rainforest and look forward to keeping you in good supply. I invite you to call to discuss your requirements. The process is simple and delivery quick all around Australia. Please have a look at our other pages for more information and contact details. Wholesale enquiries are also welcome. Our shop is opposite Kuranda Post Office, next to Foodworks.